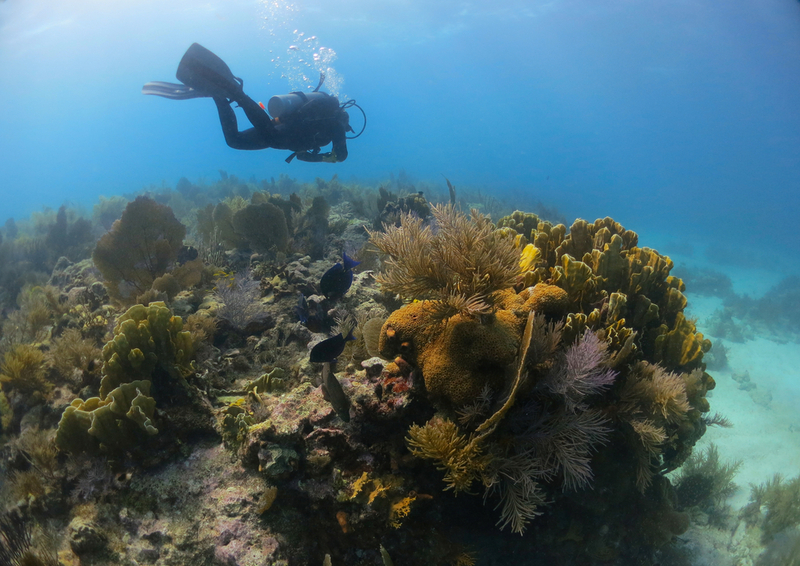 The Florida Reef off the coast of Key West is a big draw to the island for its vibrant marine life and colors. It’s the third-largest living coral reef in the world, and snorkeling and scuba adventures bring this hidden treasure into the eyes of many. Unfortunately, coral reefs around the world are deteriorating. To ensure these “rainforests of the sea” exist for generations to come, everyone can do their part in lessening human impact. Here are some tips on what you can do while in the Keys to have minimal effect on the reef. Just a drop of sunscreen with oxybenzone (BP-3) can cause significant damage to corals. Luckily, every year more sunscreen companies nix this harmful chemical from its products. When shopping for sunscreen, avoid lotions that contain oxybenzone, also known as benzophenone-3 or BP-3. Even sunscreens that say “reef-friendly” or “biodegradable” may contain this chemical, so make sure to read the fine print! Zinc oxide and titanium oxide are not known to cause damage to coral, so lotions with these ingredients are regarded as safe to use. Suggested brands: Raw Elements, All Good, Totlogic, Blue Lizard, Jason Mineral sunscreen. See the Environmental Working Group’s list of approved sunscreens here. Even safer than mineral-based sunscreen is simply covering up. Wearing a hat, sunglasses and UV protective clothing is just as effective to avoid sunburn. While snorkeling or scuba diving in Key West, beautiful corals may be tempting to touch. Not only should you not touch coral, it’s also important to pay mind that your gear doesn’t touch corals either. Be especially cautious when swimming above coral in shallow waters. Maintain a good distance from corals so they can continue to grow. Help marine ecosystems function by letting them be. Don’t feed fish or marine life! Reef fish clean harmful algae off coral, but when these working fish are fed by humans, this symbiotic relationship breaks. Enjoy the bright colors of tropical marine life without interfering so these creatures can continue to exist in harmony for years to come. Thinking of snorkeling the beautiful waters of the Florida Keys? Check out deals at 24 North Hotel, which offers free, hourly shuttle service to Old Town Key West.